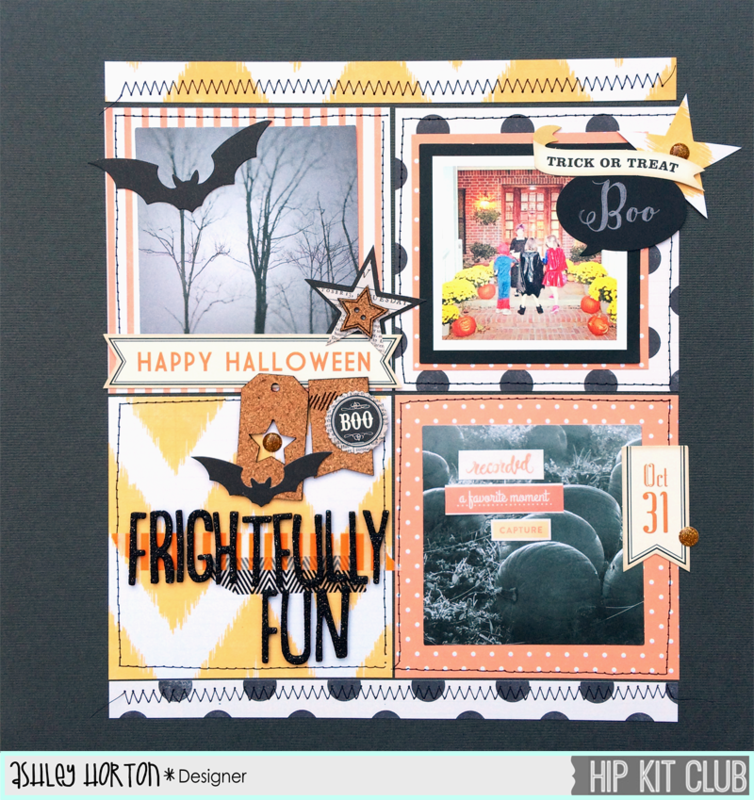 It's time to share a new layout and card for Hip Kit Club, using the October 2014 Hip Kit & Add-On Kits! I couldn't resist creating a couple of more Halloween projects, with the fun Halloween themed goodies included in this month's Kits! 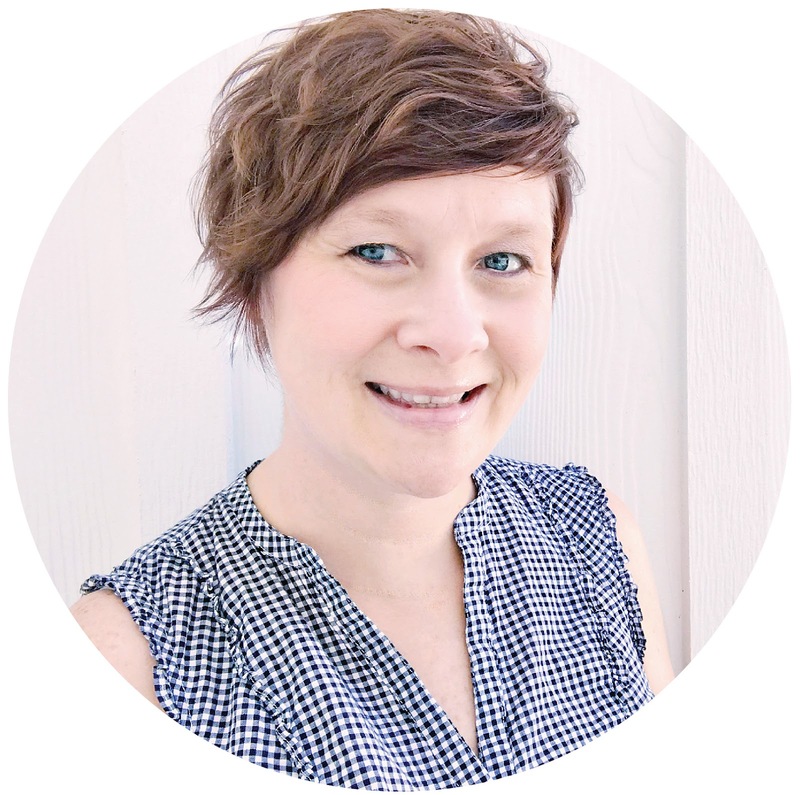 If you're looking for a fun way to incorporate several photos or a lot of embellishments onto your page, then why not try a grid design! I wanted to use the awesome cards in the American Crafts Haunted Hollow Bits pack, and thought a grid design, would be the perfect way to add them to my layout. I also wanted to use several of the patterned papers, so I cut 4.5x4.5 inch squares, to use as my grid. 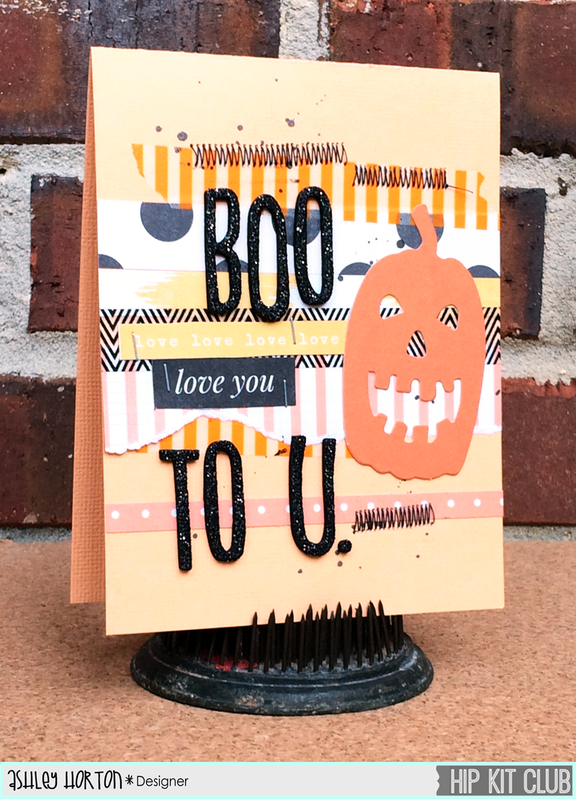 I wanted the background to be simple, so I used the dark Gray cardstock from the Cardstock Add-On Kit. Once I had each of the squares in place, I stitched around each one with my sewing machine. And then I had plenty of room for adding my title, using the Journal Thickers and embellishing each of the patterned paper squares. Scrap papers to the rescue! I just can't resist using my scraps, to create cards...especially since I can't bring myself to throw away any of the left over pieces in my Hip Kits each month! 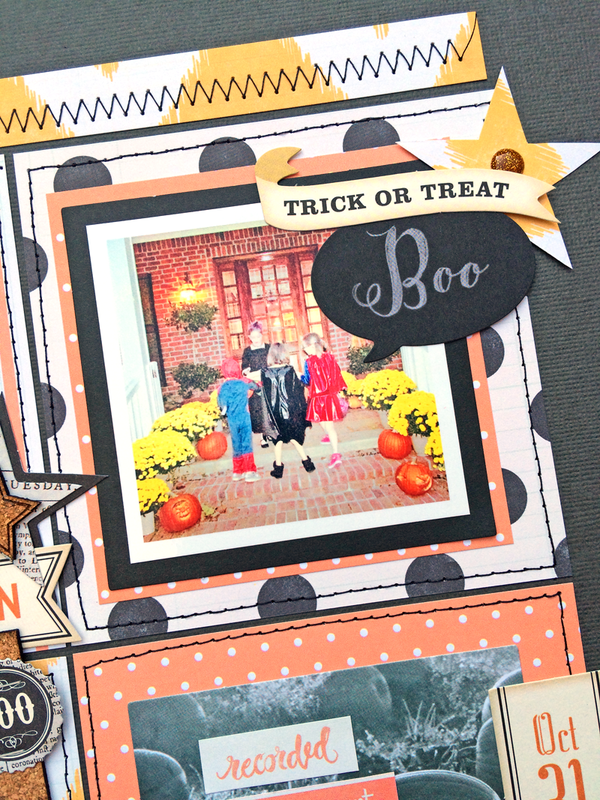 I used several left over strips from my Frightfully Fun layout on this card. I wanted a somewhat messy look, so once the strips of paper were in place, I added some Washi Tape over them and then added some zig zag stitching. 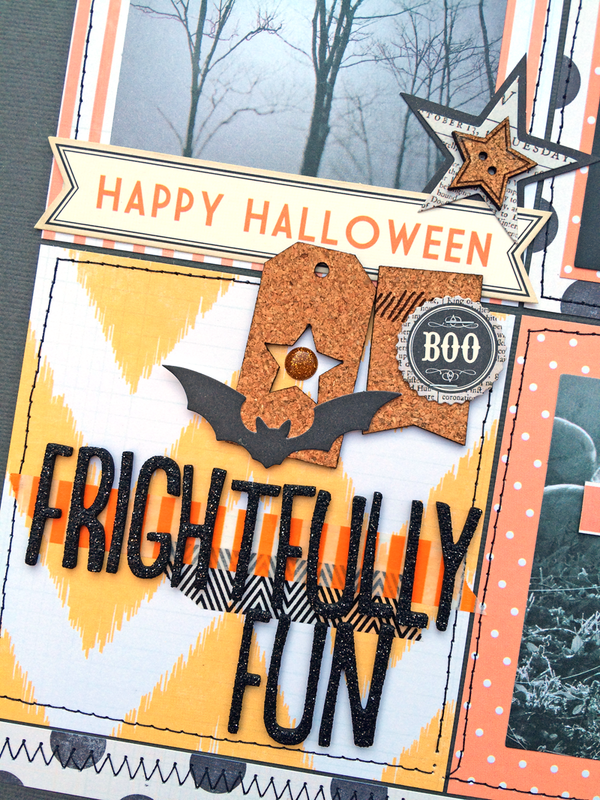 The Journal Thickers worked perfectly for adding my sentiment, and I used the Jack-O-Lantern from the American Crafts Haunted Hollow Bits pack to add the finishing look to my card. 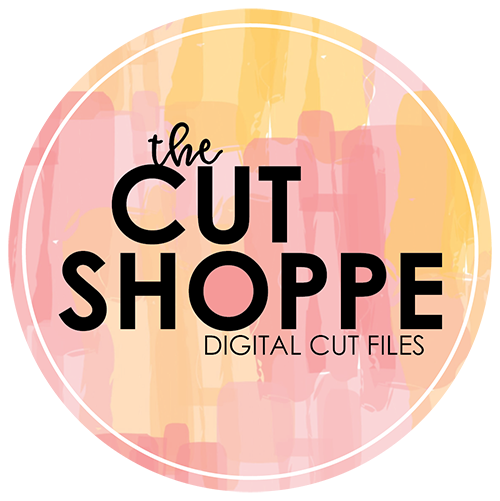 I'll have one more layout and card to share with you, using the October 2014 Hip Kit & Add-On Kits, and then it will be time for the new November Kits! The November Hip Kit & Add-On Kits will be filled with lots of awesome Christmas goodies, so make sure you visit the Shop to check them out! A Flair for Buttons | He Calls It "Yogrit"